October happens to be a significant month for SFTT since October 25th is our one year anniversary since we launched. What an incredible year it has been. We have reached far beyond my imagination. I'm humbly grateful for your taking this journey with us! Our September series - Mosaic - concluded last week. If you haven't had a chance to read the final story about overcoming a family's abusive legacy read here or click on the link down below. In honor of Pregnancy & Infant Loss Awareness Month, we begin our Remembering You series. This week Still Standing Magazine contributors, Amie and Jess share beautiful and heartbreaking moments of their child and their loss. Sisters I know reading about child loss is hard. 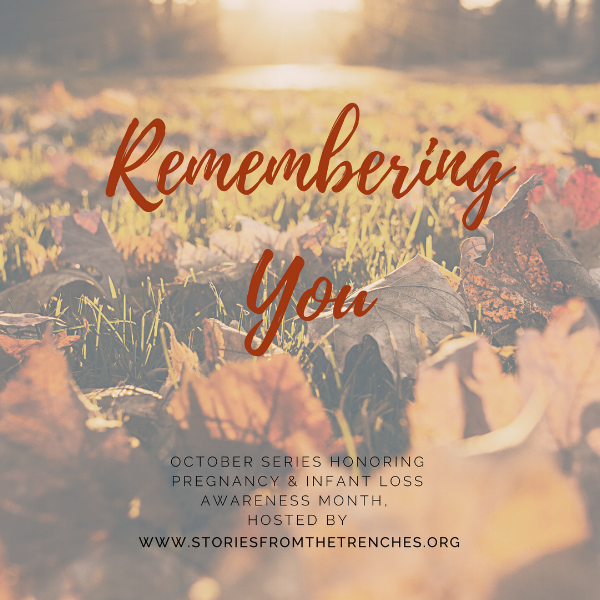 I know it hurts in places you didn't think could hurt when you try to imagine losing your own child, but I ask you to dive into the loss trench this month. These women need our love, our encouragement and our support as they bravely share their pain with us. Please read, comment and share their stories. Also we will be having daily prompts on our Facebook page for you to join in discussion. Last year the Board of Directors of SFTT purposely chose October 25th to launch the website because October 25th is Eli's angelversary. A launch date meant to shed light and hope in my own personal darkness. I have to tell you I'm not really fan of October but you my sisters have given me such light & hope this past year. I'm joining the grieving this month but know how very much I love all of your shining lights.